Over the past two decades, a select group of small but highly effective grassroots organizations have achieved remarkable success in protecting endangered species and forests in the United States. The Rebirth of Environmentalism tells for the first time the story of these grassroots biodiversity groups. Author Douglas Bevington offers engaging case studies of three of the most influential biodiversity protection campaigns—the Headwaters Forest campaign, the “zero cut” campaign on national forests, and the endangered species litigation campaign exemplified by the Center for Biological Diversity—providing the reader with an in-depth understanding of the experience of being involved in grassroots activism. Based on first-person interviews with key activists in these campaigns, the author explores the role of tactics, strategy, funding, organization, movement culture, and political conditions in shaping the influence of the groups. He also examines the challenging relationship between radicals and moderate groups within the environmental movement, and addresses how grassroots organizations were able to overcome constraints that had limited the advocacy of other environmental organizations. Filled with inspiring stories of activists, groups, and campaigns that most readers will not have encountered before, The Rebirth of Environmentalism explores how grassroots biodiversity groups have had such a big impact despite their scant resources, and presents valuable lessons that can help the environmental movement as a whole—as well as other social movements—become more effective. 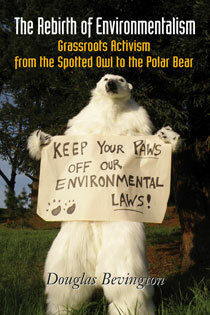 "This is an important and timely examination of the environmental movement, past and present. The politics of protecting America's wild places can be slow and infuriating, but Bevington does a first-rate job of showing how the struggle pays off, and why the stakes are so high." Carl Hiaasen, author of "Nature Girl"
"The environmental movement is an ecosystem of its own, and Douglas Bevington does a fine job examining the understory that flourishes in the shade of the big green groups. This will be a useful text for those trying to figure out how to build the global warming movement in the years ahead." Bill McKibben, author of "The End of Nature"
"In The Rebirth of Environmentalism, Douglas Bevington tells how radical and resource-poor biodiversity activists came to be at the center of environmental policy change. Deeply researched and persuasively argued, this book invites social movement scholars to rethink ideas not only about the relations between movement radicals and moderates but also about the tactical ingredients of movement success." "With a sociologist's keen eye, Douglas Bevington gives us a close-up account of the 'alternative environmental movement' that emerged in the 1990s. His cogent analysis offers a robust counterpoint to name-brand environmentalism and to critics who declared the movement dead. Essential reading for serious students of conservation—and anyone interested in the future of Planet Earth." "Mr. Bevington, a sociologist, has put together a very useful profile of many small groups. They are thriving and making a difference."